The most elegant, reliable, and best selling solution to the most feared failure of the M50 family engines: Oil pump sprocket failure. Chances are you lost that engine. At VAC we hear this all the time. It happens to the most unsuspecting BMW enthusiast more than you might think. In fact, this is the most important upgrade you can do for an M50, M52, S50us or S52us engine. This kit is very popular for a reason; it eliminates all failure modes permanently while retaining serviceability. Some people believe it is enough to weld the OEM nut on, or use a different nut, or safety wire, however in these cases this does not solve the shearing of the gear on the shaft (completely off!) and in some cases can make things worse! Worst of all? This oil pump issue effects 100% stock or modified motors and we get calls and emails with these failures many times a month. An oil pan baffle is not enough. Do NOT be the victim this common failure! This kit is the best solution on the planet, addressing 100% of the issues. Legal in all known racing classes UPGRADE your oil pump with a VAC Oil Pump Upgrade Kit and safeguard yourself against silly yet extremely costly oil pump failures: Designed to fix the problem permanently! M50 Family Use with all M50 family engines, including : M50 & M50tu, M52, S50us and S52us spec engines. 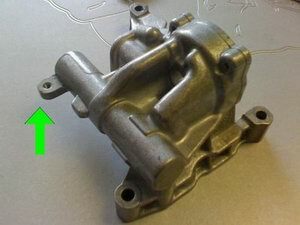 S50B32 For installing a M50 family pump onto the S50 Euro engine, or S54 engine. Commonly seen with swaps into E36s, E34s and E30s. Kit install is simple but requires a shop press. Ever have an oil pump sprocket retaining nut back off and lose oil pressure? How about shearing off the oil pump shaft with the sprocket and nut still attached? Chances are you lost that engine. At VAC we hear this all the time, it happens to the most unsuspecting BMW enthusiast more than you might think. In fact, this is the most important upgrade you can do for an M50, M52, S50us or S52us engine. This kit is very popular for a reason; it eliminates all failure modes permanently while retaining serviceability. Some people believe it is enough to weld the OEM nut on, or use a different nut, or safety wire, however in these cases this does not solve the shearing of the gear on the shaft (completely off!) and in some cases can make things worse! Worst of all? This oil pump issue effects 100% stock or modified motors and we get calls and emails with these failures many times a month. An oil pan baffle is not enough. Do NOT be the victim this common failure! This kit is the best solution on the planet, addressing 100% of the issues. 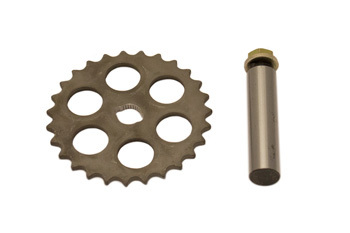 Legal in all known racing classes UPGRADE your oil pump with a VAC Oil Pump Upgrade Kit and safeguard yourself against silly yet extremely costly oil pump failures: Designed to fix the problem permanently! VAC Upgraded Oil Pump BMW M50/M52/S50us/S52us – A fresh pump with our OPUK already installed for you!